Posted on December 3, 2018 at 4:37 pm. On December 2, 2018, Free Speech For People Board Chair, Ben Clements, joined Weekends with Alex Witt on MSNBC to discuss the latest developments in the investigation by Special Counsel Robert Mueller and holding the President accountable to the law. In addition to the Mueller investigation, Free Speech For People launched, in January 2017, a campaign calling for an impeachment investigation of the President. While the Mueller investigation is exploring any potential criminal activity conducted by the President and his associates, an impeachment investigation would hold the President accountable for violations of the Constitution. 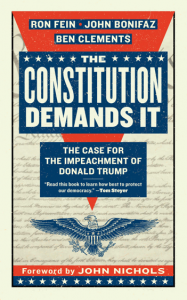 For more information on the legal grounds for an impeachment investigation of the President, visit impeachmentproject.org/book. « JASON SATTLER FOR USA TODAY: THE ONLY OPTION LEFT IS IMPEACHMENT.